Area: On the corner of Xiangyang Bei Lu and Julu Lu, up on the fourth floor, sandwiched between Kartel and Fabric club (ex-Room). Within a couple blocks you've got Perry's, Strictly Cookies, Egg, Le Saleya, the Xiangyang / Changle Corner Of Cheap Breakfast Foods, Southern Belle, IAPM, and Donghu Lu. Jing'an Temple is a ten-minute walk away. 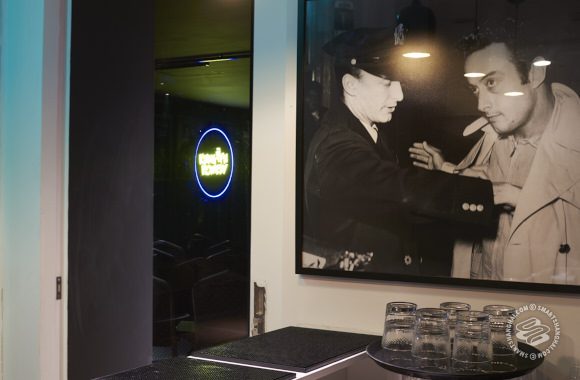 The space used to be an event room / storage area for Kartel, but then long-running comedy promoters Kung Fu Komedy (KFK) rented the room, knocked down a wall, drew some curtains over the office area (and the windows), and set up their own mini-bar. Now it looks like a completely separate venue. That sketchy elevator has had problems since the dawn of man, which means a steady stream of Kartel customers take the stairs, and they'll likely peek inside as they ascend to the fifth floor and that rooftop. 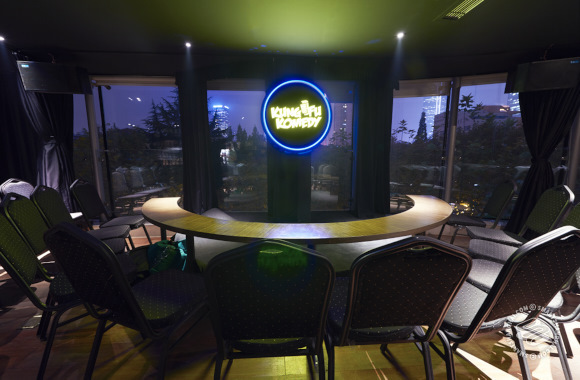 What It Is: KFK's founder, Andy Curtain, and the club's manager, Zack Conquer, call it the first comedy club in China. In the sense that they run their own bar and do not share revenue with a parent bar, they might be right. 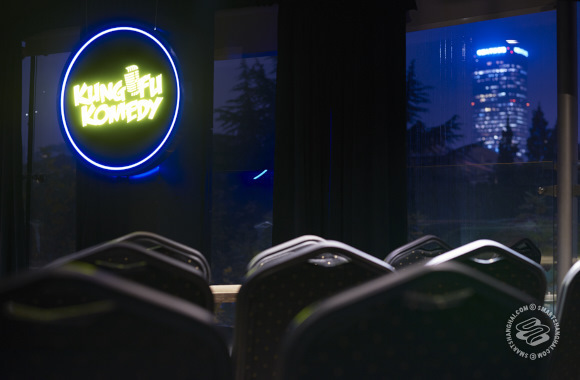 There are several comedy organizations and stand-up shows in China, but to our knowledge, there are no independent venues purely dedicated to comedy as there are in the West. 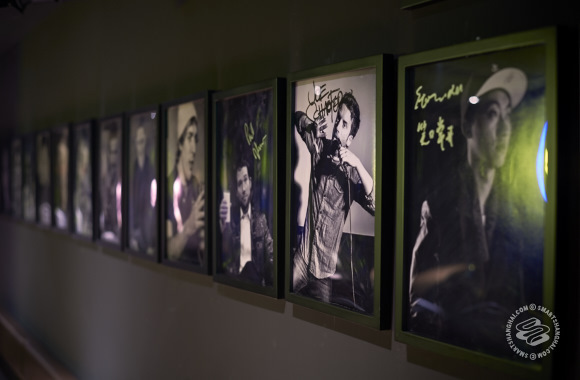 There is, of course, comedy at other venues in Shanghai (Zmack and Punchline Comedy come to mind), specifically at the Shanghai Comedy Club in Masse bar, whose stage was built by Andy and his crew when they ran KFK there until late 2014. For whatever reason, that partnership did not work out, but Masse venue still has comedy every week, including touring acts. For a while after that divorce, KFK did their bigger shows in The Camel, and hosted their open-mic nights at Into Ark near Sinan Mansions for about half a year. Kartel first approached them two months ago about the new space, and the decision was made for them when Into Ark's owner suddenly decided she didn't want to be a bar owner anymore (now the space might be called "Mr. Viper"). Three weeks later, KFK hosted their first show at their own club. That was last night. To be clear, this is not a lounge or a bar that does comedy events, like 390 once did and venues like the Kerry Hotel, Masse, and Zapata's still do. KFK is just a dark fishtank of a space that showcases comedy five nights a week. But can Shanghai support such a venue? In the US, headliners travel the country most days out of the year, bringing comedy clubs new acts each week. In Shanghai, that constant influx of talent doesn't exist on its own [yet]. What the club does having going for them are several Shanghai-based, resident comedians, including Andy himself. Many can do a full hour of comedy as a headliner and others can do opening acts. Some are quite talented, and though their material is largely about China, a lot of it is surprisingly good. If you're new to the country, you may not get some of the jokes (and if you've been here a while, you might sigh or even glower at them). As for the schedule, Wednesday and Sunday are open mic nights, Thursday may see some improv, and weekends will be headline shows, sometimes with international guests. In the coming weeks, they've already booked Dashan (this Saturday), Glenn Wool, Graham Elwood, and Matt Davis. Some nights will be purely in Mandarin, as Shanghai builds up its range of local talent like Storm Xu. Is nightly comedy sustainable with a scene as small as Shanghai's? An hour of comedy can take a year or more for a comedian to produce. It's possible that the local comedians might run out of new material for the weekend shows between international headliners, resulting in repeat acts with the same jokes. Of course, you won't notice if you're only going once a month. On the other hand, this might push them to work even harder. Atmosphere: Though small, the club manages to fit 120 people (and thank god it's non-smoking, given the size of the room). 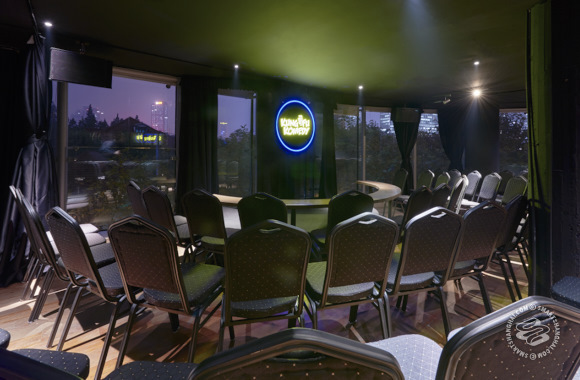 The atmosphere is tight and focused on the stage, which is a half circle in the New York style of comedy clubs. No tables, just chairs, theater style. It's perfect for stand-up, but could be a bit tricky for improv. Black curtains and painted walls envelope around the brightly lit stage -- the only lit area when the comedy is on. From a comedy perspective, this makes complete sense. The audience should focus on the person holding the mic and telling the jokes, and nothing else. From a design standpoint, some might argue that the decision to cover up the windows and their fine views of the city is a wasted opportunity to make the place look completely unique. When the curtains are drawn, there is not much difference between this place and a comedy club in say, Nebraska. One big difference though, is the lack of waiters, which you would find in many clubs in NYC or SF. This is partly because of limited space, but it's also a conscious choice on Andy's part. He believes that waiters distract from the comedy, and he'd rather avoid that than sell more drinks. This, combined with the lack of tables and standing space, does mean that like a movie theater, patrons might leave immediately after the show. Damage: The cover price seems cheaper than you'd expect. The ticket for local acts will cost you 50rmb in advance or 70rmb at the door. Bigger international acts are more expensive, with prices depending on who's performing (usually 150-200rmb). Bottled beer ranges from 30-50rmb with Asahi, Corona, and Brooklyn IPAs on offer; wine by the glass starts at 40rmb; and cocktails are 40rmb. They don't have a kitchen, but they are considering the possibility of adding snack options later down the line. All together, a night of comedy with a nice buzz going might run you a little over 100rmb. Not bad at all. Who's Going: Roommates and co-workers of whoever is bombing on stage. Hah! KFK has a dedicated crowd that's about 80% expat / 20% local, so for sure they'll be out. Otherwise, it's hard to say, as the club officially opens tonight. Probably a mix of expats and English-speaking locals. This might be the place where many (foreign and local) see their first stand-up comedy show. Some may not yet realize that speaking or playing with phones in such shows isn't tolerated, like it is in movie theaters, fashion shows, or classical concerts here. Comedians will make it their mission to let people know when it's time to be quiet, and sometimes the resulting spectacles are even funnier than the pre-written jokes. Just a heads up. Opened: Nov 13, 2015 | Address: 4/F, 1 Xiangyang Bei Lu, near Julu Lu | Full Listing Prices: Beer, 30-50rmb | Wine by the glass, 40rmb | Cocktails, 40rmb.